In this article, I hope to discuss the roots of bribery and corruption which has engulfed the Sri Lankan State. I am of the view that corruption cannot be eliminated by a ruling party which does not involve people actively in the process of governance or by making a constitution which is confined to the Executive only. In the next article, I hope to discuss the methods and systems that can be introduced to eliminate corruption by adopting a constitution with more weight being placed on the needs of the people. Bribery and corruption can be considered a deadly cancer which has penetrated deep into the institutional system of Sri Lanka, draining its essence and rendering the country hapless. The magnitude of the growth of bribery and corruption in Sri Lanka can be considered as an ugly and destructive epidemic created and nurtured by the rulers of the country from 1977, rather than a phenomenon that occurred naturally and spontaneously. Bribery and corruption was the -repeated and debated topic during the 2015 presidential election. The anti-Mahinda theoreticians in their analyses painted a dismal picture of Mahinda Rajapaksa to the country as the first Head of the State who had introduced grand-scale corruption to the country. 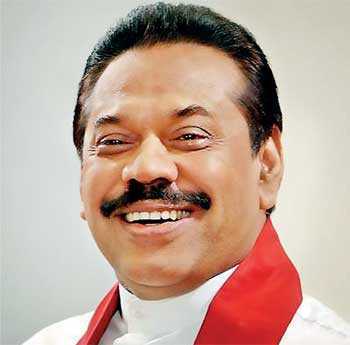 As a result, the people tended to perceive the predecessors of Mahinda Rajapaksa as very clean and good leaders. Even though the regime of Mahinda Rajapaksa can be considered a period in which bribery and corruption reached a maximum height, it was indeed President J.R. Jayewardene who introduced large-scale corruption to the country at State level. Of all the leaders of the country, it was JR who could be considered the only leader who had the ability to put the country on the right track and made tremendous development provided he had an honest and genuine interest in doing so. He had the knowledge, the ability, the education, the maturity and the courage required. Yet, he lost the opportunity he had to become the saviour of the country because he attached more importance to his selfish interests rather than to the pressing needs of the country. Napoleon was JR’s ideal hero and the character that most influenced him. It was the bad luck of the country that he emulated only Napoleon’s worst characteristics and not his good qualities. Napoleon can be considered a belligerent and ambitious leader who attempted to build an empire with the help of a mercenary army. To a greater extent, he was successful in achieving his ambition. In this endeavour, Napoleon allowed his mercenary army to plunder the treasures of the cities they captured. This was a special strategy adopted by him to maintain the aggressiveness and military spirit of his armies. JR introduced a presidential system of government, deprived Parliament of the unique status that it enjoyed up to then, divested all its powers and sovereignty and had them transferred onto him, thereby making the Parliament a mere rubber stamp of the President. This change invariably caused a stripping of the powers and recognition of the MPs. In order to prevent the Parliamentarians revolting against this move, JR gave them a boon, or in other words, allowed them to plunder the resources of the country in the way Napoleon permitted his mercenary armies to plunder the treasures of the cities they captured, keeping to his famous statement that “an army marches on its stomach”. Prior to 1977, parliamentarians weren’t allowed to do business with the Government. That was the tradition that prevailed up to then. The MPs who had done business were deprived of their parliamentary seats. This is a prime principle being practised in all countries where there is a democratic system of government. Accordingly, the MPs were prohibited to serve as Government contractors, Government suppliers, act as Government license holders, or become buyers of public properties or sellers of properties to the Government. The best illustration of this practice is Albert Silva, a UNP candidate elected to Galle constituency in 1977. He lost his parliamentary seat by a Court ruling on the ground that he held a kerosene permit issued by the Government in his name. President Jayewardene did not abolish the law pertaining to this. But, he disregarded the tradition and suppressed the imposition of the law, making it virtually inoperative. By doing that, he granted the MPs of the ruling party the freedom and the right to conduct business with the Government without restrictions. So they were allowed to serve as Government contractors, Government suppliers, become Government license holders, and buyers of public properties and sellers of properties to the Government. 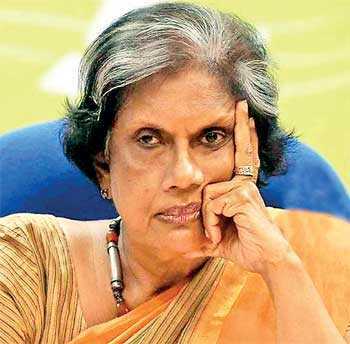 At the outset, President Jayewardene himself was not hesitant to set a precedent encouraging his followers and ridding them of fear or shame, if they had any, in pursuing this unethical and illegal practice. He exchanged a barren coconut land with very old trees that belonged to him for a fertile coconut land owned by the Land Reforms Commission. JR cannot be considered a person who was too greedy for property. His greed was for power and not for property. He may have done this purposefully to persuade his followers who were scared and hesitant to pursue this unethical practice which they considered a grave offence. Perhaps JR wanted to rid them of their fear. With this example set by the President himself, widespread looting of public property became the order of the day and it grew into a large-scale phenomenon. Not only the ministers and the MPs of the ruling party, Government officials and the supporters of the ruling party too hopped on the bandwagon in looting public property with impunity. Some of them became planters by purchasing valuable lands belonged to the Land Reforms Commission together with the estates and the valuable buildings standing in them at a nominal price. Those who were not so clever obtained lands subject to the limit of 50 acres while those who were smart were able to manoeuvre this opportunity and acquire lands to the tune of thousands of acres on long-term lease agreements in the name of companies which were formed hurriedly. Some others became licensed sand dealers and major contractors, supplying goods to Government institutions. In consequence of undue interference of people with political power and political patronage in these sectors, implementation of law collapsed, and undue profits earned by political henchman increased, while the losses incurred by Government enterprises soared. All the Presidents who came to power after JR pursued the same corrupt system introduced by JR, sometimes adding more and new features to it. During the reign of President Chandrika Kumaratunga, liquor licenses were issued via MPs. The number of licences issued exceeded 1,200. The MPs of the governing party, in addition to the other means of business, became tavern owners as well, directly or indirectly. JR pursued this wicked and corrupt system to satisfy his supporters and cronies. He did not use it to earn money for him. But, all the other Presidents who succeeded him converted it into a massive source of income for them. Usually, all Heads of State in Sri Lanka had businessmen to defray the costs of election campaigns. When the political leader became the Head of State, usually the costs incurred by the businessmen were repaid from public property coming under the control of the former. Even though the number that gains this golden opportunity is not numerically high, the volume of benefits they could obtain from this opportunity remained relatively high. Sometimes, the benefits accrued can be as high as Rs. 100 million for every Rs. 1 million spent. Gradually the scope of this predatory system expanded, developing into a destructive system, enveloping almost all Government institutions and the private institutions which engaged in business with the Government as well. It has corrupted the entire system of institutions, run down the income received by the Government, increased indebtedness and inefficiency of the country and in short rendered the country hapless. It is obvious that there is a big gap between the real price and the price paid in respect of every transaction made with the Government. While this gap or difference can be considered as the share of corruption, a major portion of it goes to politicians while the remainder goes into the pockets of Government officers and agents. Development projects implemented since 1977 cannot be considered to have been implemented after taking the priority needs of the country into consideration. Most of them have been implemented without giving due consideration for environmental impacts, the true needs of the people and the future of the country. Often priority had been given for unimportant and parochial factors like the amount of wealth that could be siphoned off for personal use, self-aggrandisement of the Head of State and benefits that could be accrued to the area or the electoral territory of the Head of State. The expected outcome of most development projects has not been generated and the income received from them has not been adequate even to pay the foreign loans obtained for their implementation. The lack of a far-reaching vision in implementing the development programs in Sri Lanka can be explained and illustrated in terms of the Uma Oya project, Colombo Port Development project, Hambantota Port and Mattala Airport projects, other irrigation projects and highway development projects. In view of the lack of space, I intend to look into the highway development projects only. The data on production costs produced here have been obtained from data published by Professor Amal Kumara, Senior Professor, Department of Transport and Logistics Management of University of Moratuwa and Prasanna Cooray. The cost of the first highway from Kottawa to Godagama was $ 7 million per kilometre. From Godagama-Beliatta it was $ 26 million per kilometre. Colombo-Katunayake highway, the cost had been $ 26 million per kilometre. For Central Highway it was $ 27 million per kilometre. According to a cost analysis made by the World Bank, in association with the Oxford University, in respect of the costs incurred in constructing highways in different countries in which highways had been built, the average cost per kilometre stands at $ 7.9 million per kilometre. 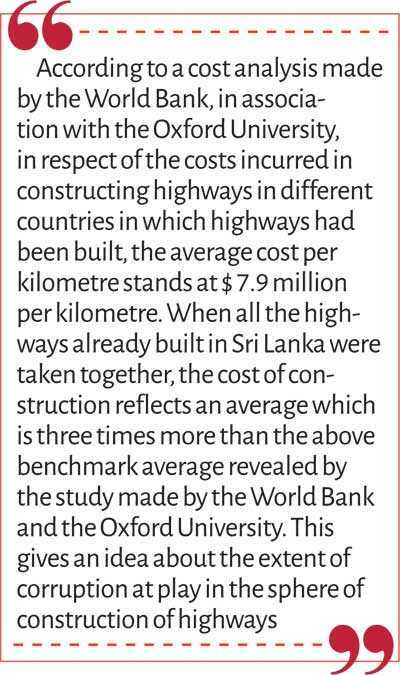 When all the highways already built in Sri Lanka were taken together, the cost of construction reflects an average which is three times more than the above benchmark average revealed by the study made by the World Bank and the Oxford University. This gives an idea about the extent of corruption at play in the sphere of construction of highways. Usually highways are built on tall columns, above ground level. But in Sri Lanka highways are built on artificial embankments built with soil brought from elsewhere. The soil needed for building highways is supplied through razing of hillocks and excavating large pits in the interior of the country. The damage caused to the environmental system by constructing highways on artificial embankments is immense. It was Suren Wickramasingha who had suggested that the highways should be constructed parallel to the railway lines. The land allocated for railway lines has a width of 68 feet or more. He therefore argued that without having to pay compensation for acquiring lands and incurring extra costs for resettlement, highways could be constructed parallel to railway lines. I am of the view that the motor highways should be constructed over and above railway tracks whilst at the same time making the development of railway lines also a part of the highway projects. The length of railway lines in Sri Lanka stands at 1,000 kilometres while the number of by-roads running across railway tracks stands at nearly 1,000. The service to the public will be immense if the obstruction of the railway by road vehicles is avoided and the entire railway network is converted into a double line system by causing the byroads to pass under or above the railway track. This will help significantly in easing of traffic congestion on motorways and offer an efficient and reasonably high-speed train service to the commuters. Even container transportation can be made to a great extent by train. Thus, while the highway system offers an efficient and faster mode of travel for those travelling in their own vehicles, the railway could provide a comfortable service coupled with a reasonable speed to those who use public transport. Had the construction of highways and the development of railway lines been made a coordinated and simultaneous project, a far-reaching change could have been made in the sphere of transportation. The anti-democratic party system of Sri Lanka which is corrupt and depends on black money can be considered an important factor that had caused the anti-democratic nature of the State. This issue had not received adequate attention of critics. No party in Sri Lanka has an internal democracy. Each party functions in a manner that gives the party leader huge dictatorial power. Mostly political parties depend on black money for their election fund rather than membership fees. None of the parties have a proper system to collect membership fees. The party members do not have the right to participate in the decision-making process. Often, political parties are maintained by the holders of black money or the black moneyed people who constitute the primary source of election funds. Prior to 1977, there were limits fixed by law on the amount that could be spent by the candidates contesting elections. Also, there was a method of calculating the expenses incurred by them. There were also occasions in which the Judiciary had deprived the parliamentary seats of candidates who had violated those limits. 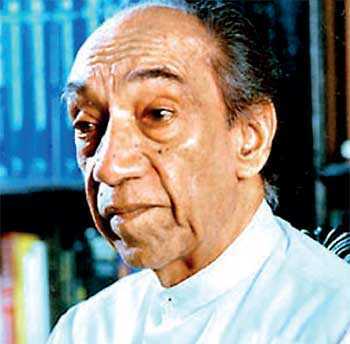 President J.R. Jayewardene when introducing the new electoral system replacing the old system did not set up an alternative mechanism to control election financing and auditing the expenses incurred. Even though an Election Commission has been set up subsequently, no attempt had been made to use, at least, the Indian Election Commission as a guide. The Election Commission of India (ECI) is a constitutionally mandated body established to foster the democratic process in India with a considerable autonomy of action. It possesses the right to inquire into the internal democracy of political parties and how they use party funds. It has the power to proscribe parties that violates the law. Sometimes, in the absence of laws, it has special powers to adopt rules and enforce them to ensure free and fair elections. 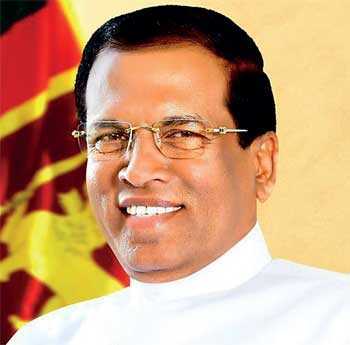 Anti-democratic and corrupt nature of the State can be considered as a reflection of the anti-democratic and corrupt nature of the system of political parties themselves in Sri Lanka. In conclusion, the political party system in Sri Lanka can be compared to an institution that trains anti-democratic and corrupt leaders for the State which is also corrupt.